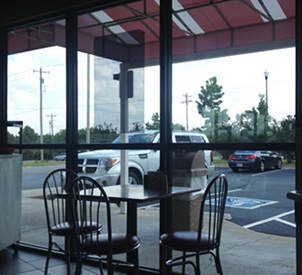 Humans have always enjoyed looking outside while dining, probly stemming from our tribal ancestors who had to keep a sharp eye lookout for marauding tribes who wanted to steal their food. That threat is long gone, but the desire to have a view from the table remains. 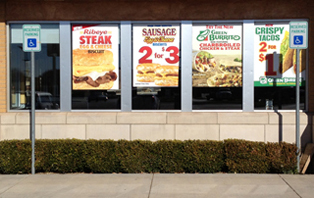 So many restraunts post promotions in their windows that I feel like I'm eating inside of a billboard. 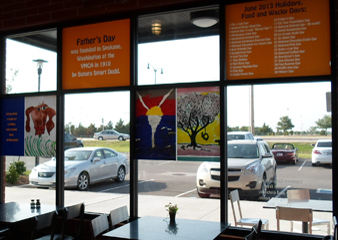 They see the blank glass space as a medium to advertise their restaurant and products. I see the glass as a portal to look out onto the passing world - traffic, sunlight, and trees. They, however, are winning. 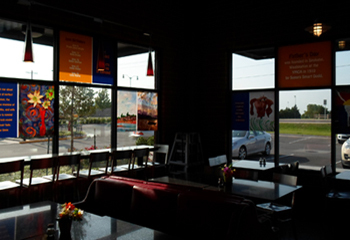 Dining areas are often compromised by the lack of open views. At least these poster ads have a see-through quality (below). The diner can't really see out, but it does let in more light. 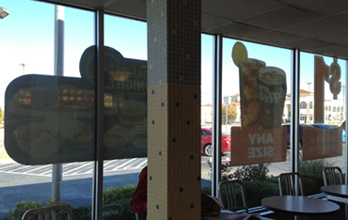 The view, though, is filtered through a burger or breakfast sandwich. 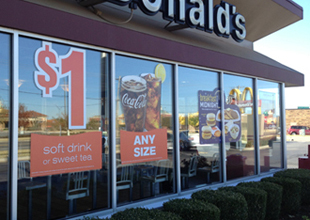 Remove all window billboard displays. 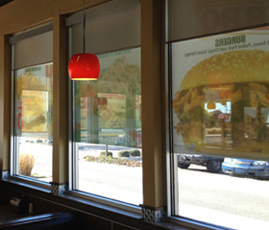 Limit window posters to just one or two window panes. Mount the ads only at the very top of the windows. 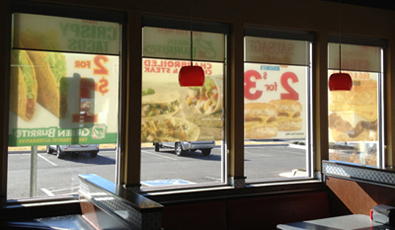 This would open up the vista for the diner and still allow the ads to be visible from the street and parking lot. Of course, no billboards at all would be better, but this could be a fair compromise. This grocery store has an extensive deli and hot and cold cafeteria. 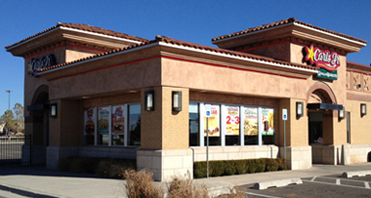 The seating area is bound on two sides by large windows. 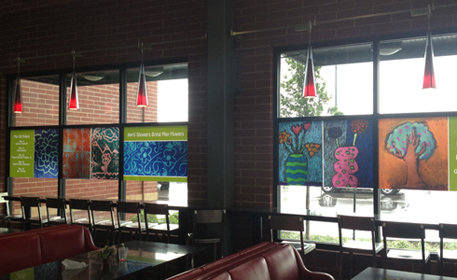 But, the marketing manager posted children's artwork directly in the line of sight, preventing many people from looking outside while they dine. An Assistant Manager said the images used to be mounted in the top row of windows (much better) but that it was harder to maneuver the ladder so they moved them down. 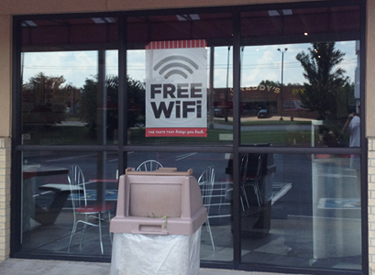 This is one great example of putting the needs of the employee ahead of the needs of the customer. He said, "Should I listen to 1 person (me) or 500 people who like the artwork?" In his shameful defense of his store, he missed the point - it's not about posting artwork, it's about where that work is posted. If mounted above, opening up the view, 500 people could still enjoy the artwork. Although, I seriously doubt 500 people told the Asst. Manager they liked the work. 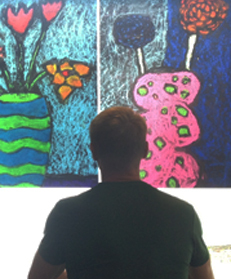 But, hallelujah, a few weeks later, however, the posters were in a different arrangement, allowing better views out the windows. Maybe he really was listening. Months later, I went back, and, wow - all the posters were up at the very top - where they should be - allowing full views out the windows.